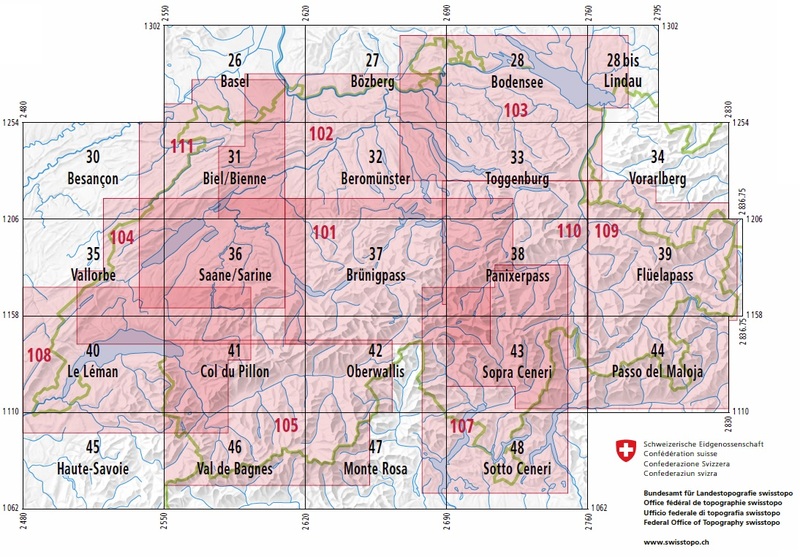 The Federal Office of Topography (SWISSTOPO) is the center of competence for the Swiss Confederation responsible for geographical reference data, for instance the description, representation and archiving of geographic spatial data (such as national maps, elevation and landscape models, satellite images, orthophotos). 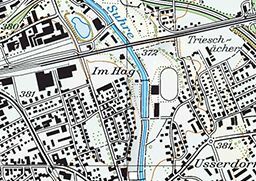 SWISSTOPO provides measurements of Switzerland, ascertains and documents changes in the landscape (geological, geodesic and topographical) and produces maps of Switzerland. 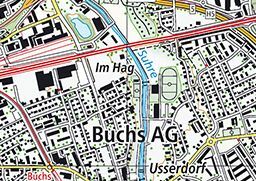 Topographic national maps (paper and digital) are updated and published regularly in various scales. Thanks to their quality and accuracy they are highly regarded in Switzerland and worldwide. Their superb use of graphic relief and hill shading, presents an almost 3-D picture of Switzerland's mountainous terrain. All scales are published as standard sheets, plus a selection of special maps, each covering a larger area and centered on popular tourist destinations. Several of the standard maps are also available in a special hiking edition. An overprint highlights footpaths maintained and way marked by the Swiss national walking association and shows bus lines with bus stops. On the reverse, there are notes, in French and German only, on way marking rules and about the area covered by the map. 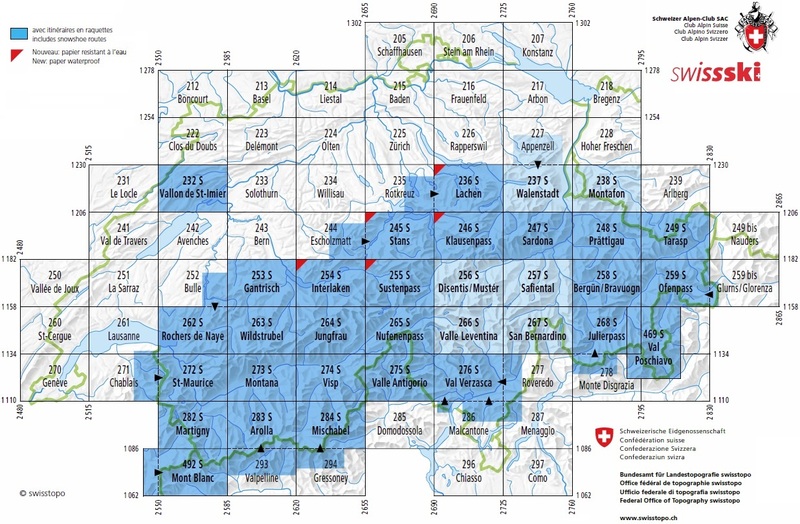 In cooperation with the Swiss Ski federation a new series of ski maps is published. An overprint highlights ski routes, cable cars, ski lifts and local bus lines with bus stops. In border areas, ski information extends to France and Italy. The legend for the overprint is in German, French and Italian only. On the reverse, there are lists of routes and alpine huts shown on the map, plus telephone numbers for all the emergency and information services. The text is in the main language of the area covered by the map. 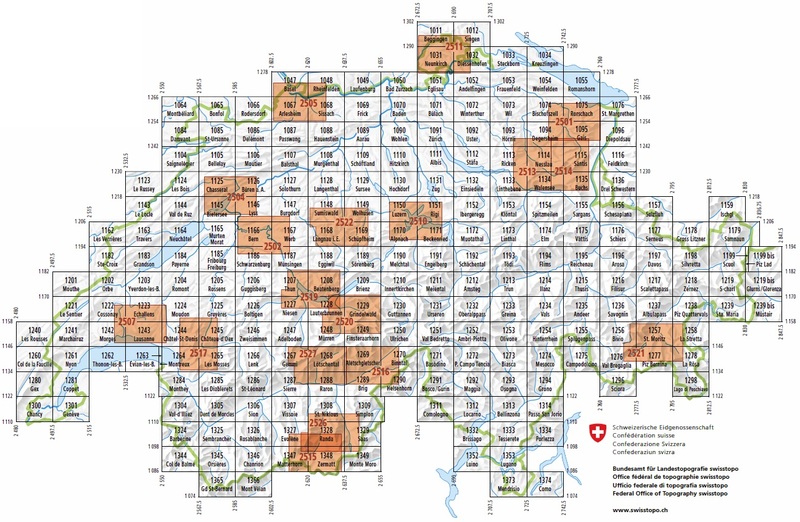 In 2013, SWISSTOPO began a comprehensive upgrade of the largest official map document for Switzerland – the national map 1:25,000 – with 247 sheets. The new construction also means changes to the cartographic representation. Legibility will be improved. Changes include a new font style and colour differentiation, making objects such as railways easier to read. The former national map 1:25,000 will be simultaneously replaced by the follow-up, with completion scheduled for 2019. In the long term, national maps of all scales will be converted. 18 composites: regions of special interest to tourists and hobby geographers on one map. 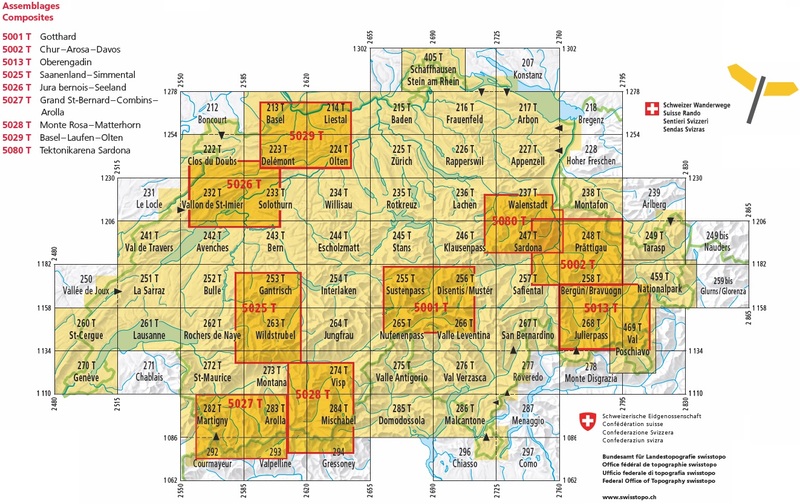 The accurate and informative topographic map of Switzerland for hikers, alpinists, cyclists, planners, travellers and adventurers. Complete rail network, all freeways and highways, most of the roads and routes. Freeways, rest areas and major roads are labelled. Distinct representations of settled areas, hydrography, and terrain. Entire Switzerland and adjoining foreign territory on 78 sheets. The accurate topographic map of Switzerland for cyclists, motorcyclists and motorists as well as travellers and adventurers. Complete rail network, all freeways and highways, all major roads and routes. Distinct representations of settled areas and terrain. Many shown objects are labelled. Entire Switzerland and adjoining foreign territory on 23 sheets. The most accurate and clearly legible general map of Switzerland for motorcyclists and motorists, rail travellers and adventurers. Complete rail network, all freeways and highways, all major and connecting roads. The most accurate general map of Switzerland for motorcyclists and motorists, rail travellers and adventurers. Reduction of the National Map 1:200 000 with the same content. Entire Switzerland and adjoining foreign territory on 1 sheet. 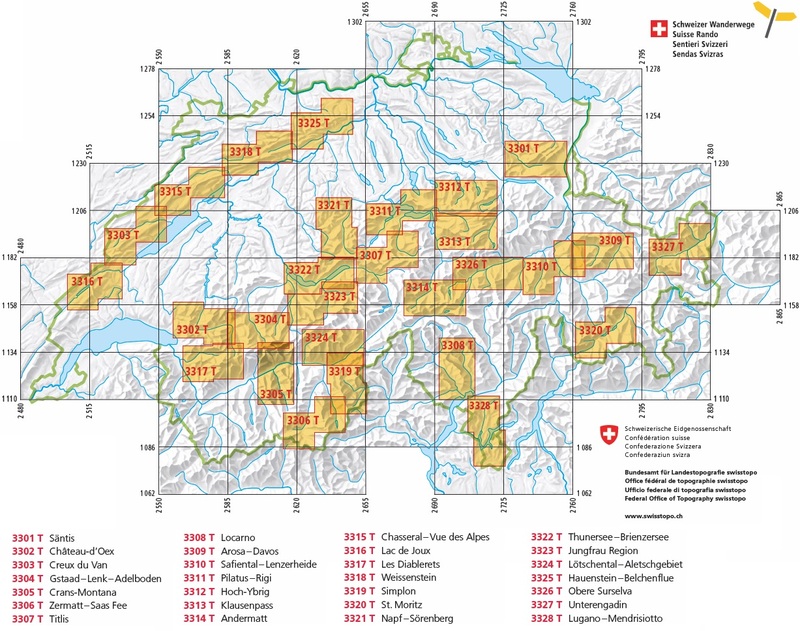 In cooperation with the Swiss Ski federation a new series of ski maps is published. An overprint highlights ski routes, cable cars, ski lifts and local bus lines with bus stops. The most detailed hiking map there is. With lots of detail and extremely accurate, the 1:25 000 scale hiking map is just what you need for trips and walks out in nature. With it you can find any trail, and the remotest places. In given its overall size, you always have the overview. The maps contain the marked hiking and mountain trails, the alpine routes as well as the post bus routes and stops. The waterproof and tear-resistant map that won’t let you down! 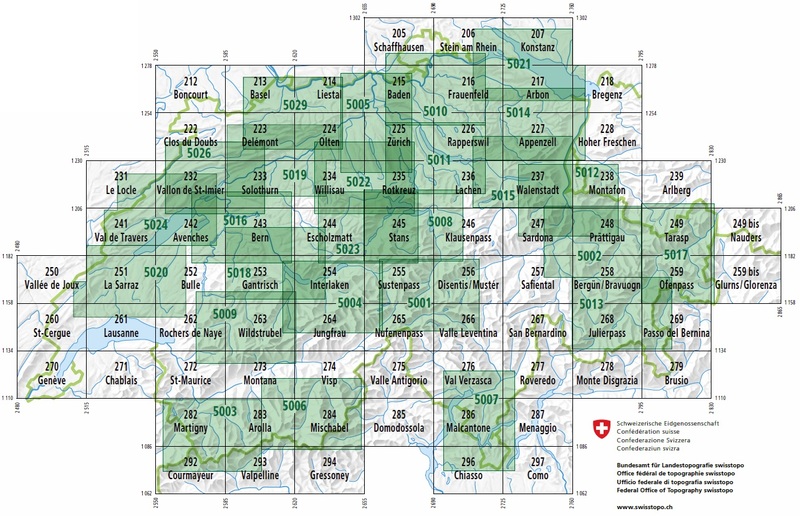 These hiking maps cover well-known and popular hiking regions of Switzerland. They are very convenient, printed on both sides and with dimensions of 11 x 17.5 cm they can fit into any jacket pocket. With an increased map scale of 1:33,333 and clear representation of hiking trails, the maps are now much easier to read. Each map includes three suggested hikes with varying degrees of difficulty. 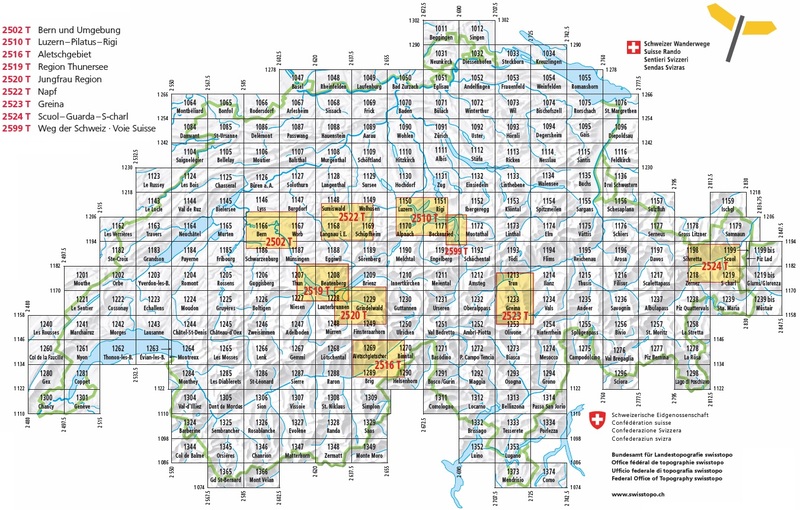 All of the hiking trails of Switzerland available on 58 sheets and 9 composites. The composite maps show interesting tourist regions on a single sheet instead of being printed on different map sheets. The 1:50 000 Snowshoe and Ski Tour Maps from swisstopo are an essential accessory for every snowboard, ski or snowshoe tour, be it during the planning stage at home or when help is needed on the slopes. There is special information for snowshoe hikers such as up-to-date information on environmentally friendly winter sports as well as mountain and avalanche rescue. On the newly designed reverse side of the map there is a route and mountain hut index. Important telephone numbers and useful internet links are available to help with the planning during the preparation of tours at home. The Snow shoe and Ski Tour Maps are published in collaboration with the Swiss Alpine Club SAC and coordinated with the latest ski tour guides. 232S Vallon de St-Imier, 247S Sardona, 248S Prättigau, 249S Tarasp, 258S Bergün, 259S Ofenpass, 268S Julierpass, 276S Val Verzasca, 469 S Val Poschiavo, 253S Gantrisch, 262S Rochers de Naye, 263S Wildstrubel, 272S St-Maurice, 273S Montana, 283S Arolla. 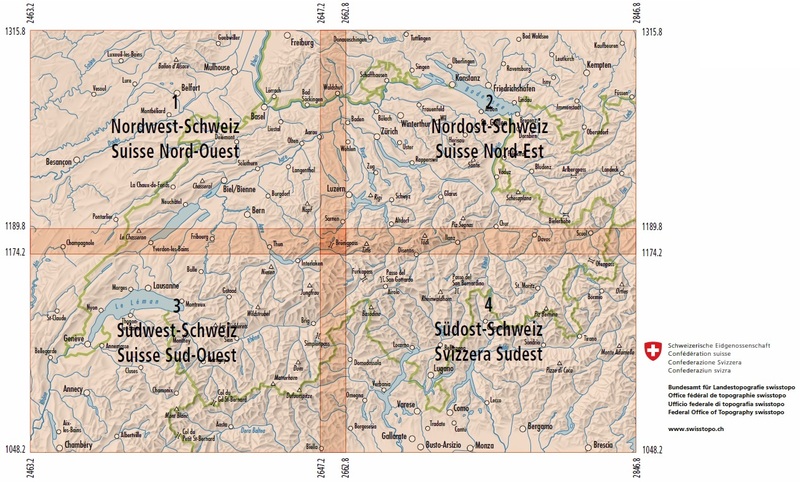 Each year the Swiss roads undergo numerous changes, and this is therefore the perfect up-to-date map from swisstopo. The road map is easily legible and shows even small localities. The highways and their accesses, the main and trunk roads as well as small routes are clearly indicated. The hill shading and tinted forest areas lend the map an even more realistic appearance. Switzerland on one map, printed on the front and back. Motorcyclists and automobile drivers appreciate this accurate map in the handy format.